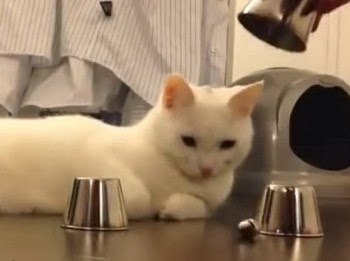 Here's a cat whose owner challenges it to a shell game (also known as the cups and ball game). You know the one: put three cups upside down on a table and place something (say, a ball, a marble, or in the case of this video a small bell) beneath one of the cups. Now switch them all around. Can the person following figure out which cup hides the item?